The topic of the perils of feeding bread to ducks has recently been in the news and we’d like to publicise this important subject a bit more widely. It’s a seemingly innocent pastime. But experts warn that feeding ducks bread is not just bad for the bird’s health – it can damage entire ecosystems, says Justin Parkinson. Throwing crumbs of stale bread in a pond or river is a ritual of family days out dating back to at least the 19th Century. Ducks vie with geese, swans, moorhens, sometimes gulls, for their fill. It’s long been recognised that a bread-rich diet – particularly processed white bread – can cause wildfowl to become ill and, in some cases, deformed. Now conservationists are warning that undigested bread sinking and rotting can create wider havoc. But not everyone will want to give up entirely an activity that is popular with children – particularly when it is duckling season. To prevent excessive build-ups of bread in one area or stretch of water, Richard Bennett (an environment manager with the Canal and River Trust) recommends dropping only part of the intended feed at one point, then walking 50 metres along the bank or towpath before doing so again. This ensures more than one wildfowl family gets a meal and reduces unnecessary concentrations of algae, bacteria and bird waste. 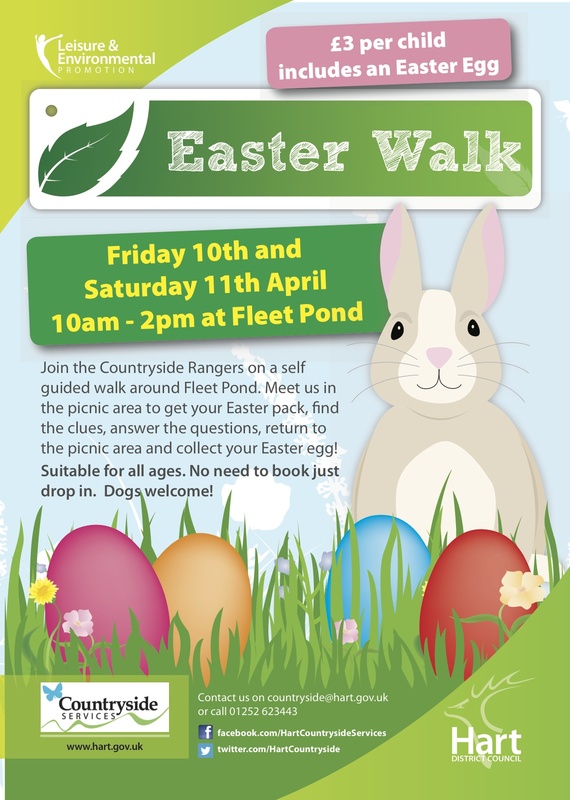 Please come and feed the ducks but do it sensibly so your children and future generations can enjoy it too. The charity is asking the public to make a few simple changes. Bread’s not great for a duck’s health as it’s nothing like their natural diet so don’t overfeed them with large quantities of it. Try to vary what you give them and swap it for healthier more natural treats like oats, corn, or defrosted frozen peas. And exercise portion control,” he said. So, the next time you visit Fleet Pond to feed the ducks and other birds, we’d be grateful if you could bear the above information in mind, they’ll appreciate you for it! Click on the arrow to watch our latest Clearwater Campaign video which gives an update on what has been achieved so far. The YouTube link is here. 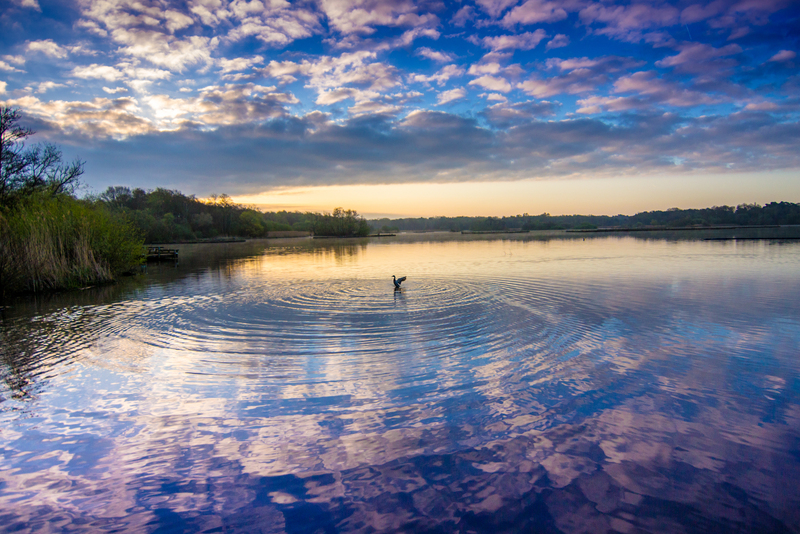 “I retired from the Environment Agency last June after 40yrs in the water industry. During that time I worked on fish farms and commercial freshwater fisheries before joining Thames Water Authority (pre-privatisation), then its successors, the National Rivers Authority and the EA. During that time I also managed ecology and biodiversity teams, but my primary responsibility was implementing our statutory duty to ‘maintain, develop and improve fisheries’. My patch was the Thames catchment, from the river’s source in Gloucestershire to the tideway, its tributaries and any lake, pond or canal in the catchment. My first contact with Fleet Pond was in the 1980’s. We were asked to help improve water quality by removing bream. We eventually took out over 2 tonnes of this bottom feeding species using large seine nets. But I began to realise that the bream were a symptom of the water quality problem, not the cause. The fine sediment carried into the lake by the Gelvert Stream and nutrients by the Brookly Stream were the main factors influencing Fleet Pond’s ecology. In the following years I worked closely with Hart DC, English Nature (now Natural England), Fleet Pond Society and Defence Estates to tackle erosion in the Gelvert’s catchment, particularly at Long Valley. More recently I was able to secure significant resources from the Environment Agency’s Water Framework Directive budget to fund the desilting and restoration works on the Pond. Reporting on environmental incidents such as pollutions, droughts and floods was an important part of my job. I routinely provided interviews and photographs for local media and made a number of short videos to promote EA projects. When I left the Agency I set up Clearwater Photography UK. Last autumn, at one of the working parties at the lake, Terry Austin asked me to help him produce a video to show FPS supporters what had been achieved in 2014 with their help. Using clips from my own library, along with the great time-lapse sequence of Lions’ View construction filmed by the Fleet Lions, stills of the dipping platform and clips I shot of recent LOSW activities, we put together Clearwater 2. The first Clearwater video featured none other than Chris Packham, so no pressure! In the event, Cathy Holden did an excellent voiceover, Terry didn’t capsize the boat and the scouts behaved impeccably. Terry is already talking about Clearwater 3, I’m thinking of emigrating! You can see the first Clearwater video on YouTube here (produced in 2010). In a previous post I mentioned that Roxanne Lewington and Tara Skinner, from the Fleet-based marketing team at Mackenzie Smith, are busily training for the very popular Fleet Half-Marathon. 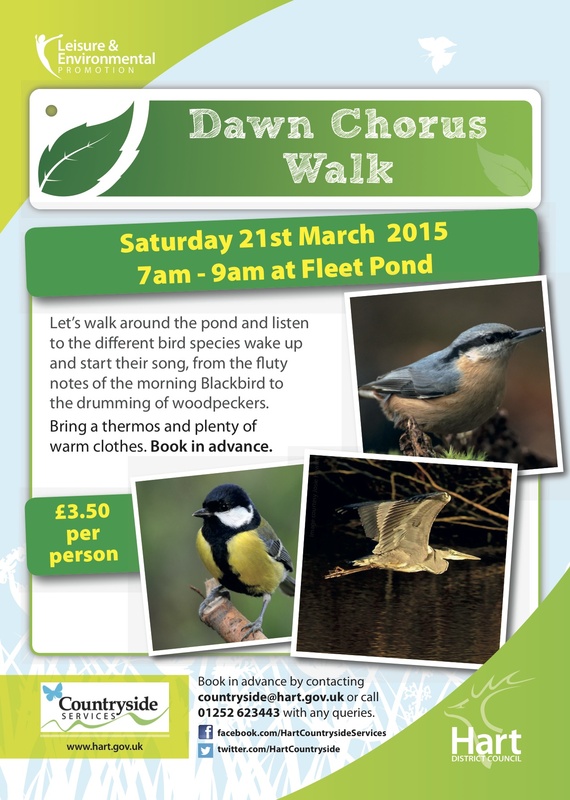 We’re very grateful that all the monies raised for this event will go to Fleet Pond Society’s Clearwater Campaign. If you’d like to support Roxanne and Tara, and in so doing help fund improvements at Fleet Pond Nature Reserve, please donate on their Virgin Money Giving page here. Everyone at FPS wishes them both the very best on the day! 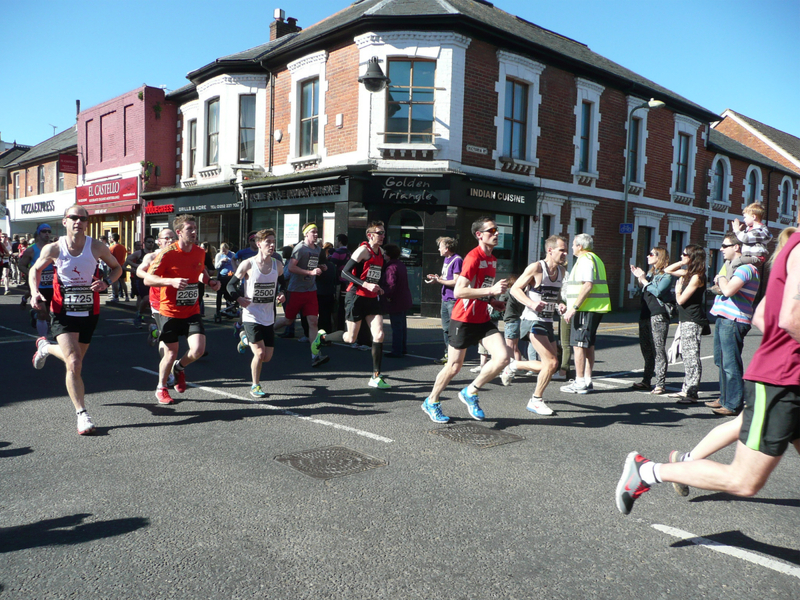 Full details of the Fleet Half-Marathon on Sunday 22 March can be found here. Why not come along and cheer the participants on – it’s a really good event! 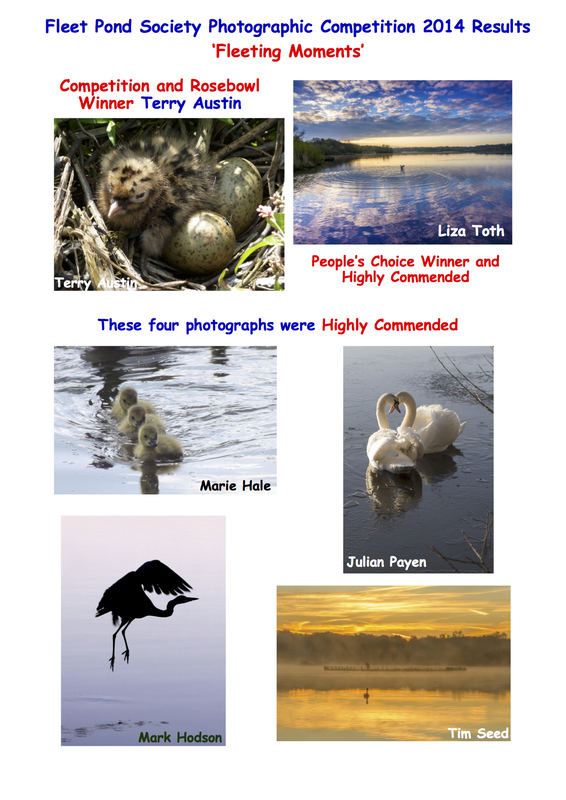 The results of Fleet Pond Society’s popular Photographic Competition were announced at the FPS AGM on Saturday 21st February. The theme for the competition for 2014 was ‘Fleeting Moments’ and the poster above gives snapshots of the winning and highly commended entries. The Competition and Rosebowl Winner for 2014 was Terry Austin. 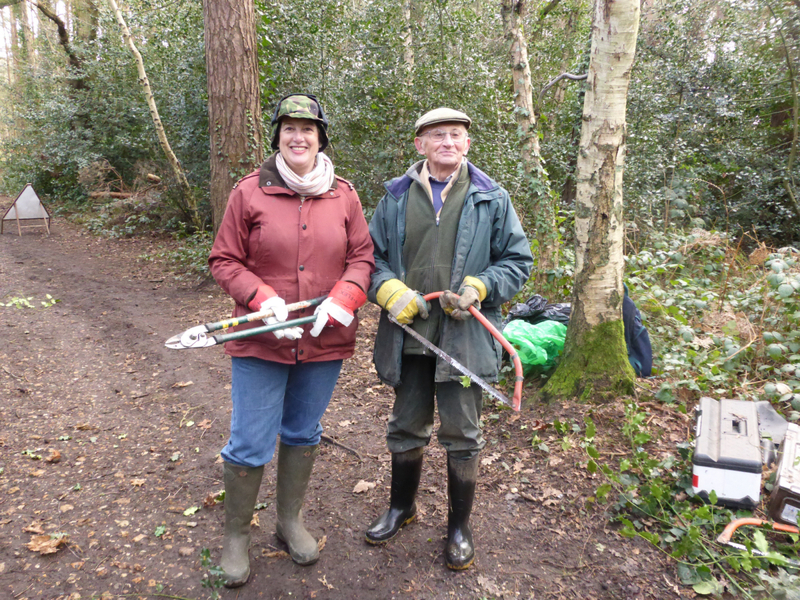 Terry is the Deputy Chairman of FPS and is well-known for his many contributions to the conservation of Fleet Pond (see for example here). 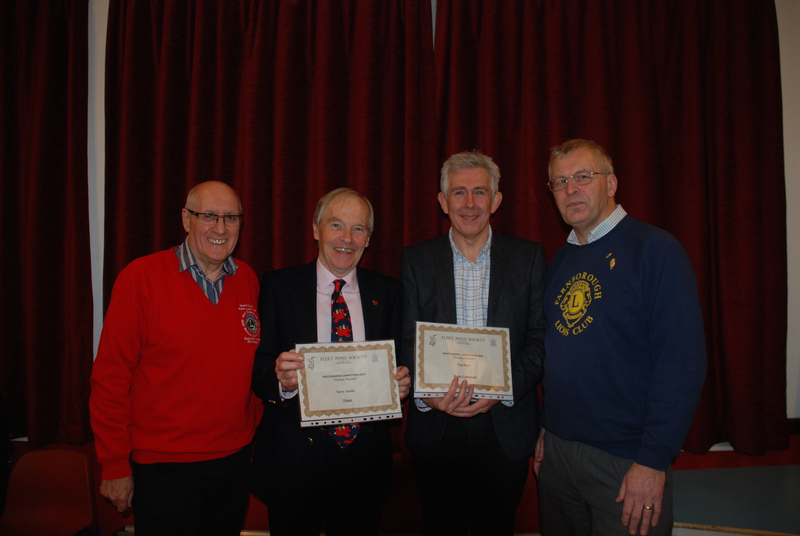 Below is a photo from the award ceremony at the AGM. The photos below are high resolution versions of the entries by Terry Austin and Liza Toth (please note that these are both rather large files). The competition for 2015 will be announced later this year. You can see the winning entries for the competition from previous years here. 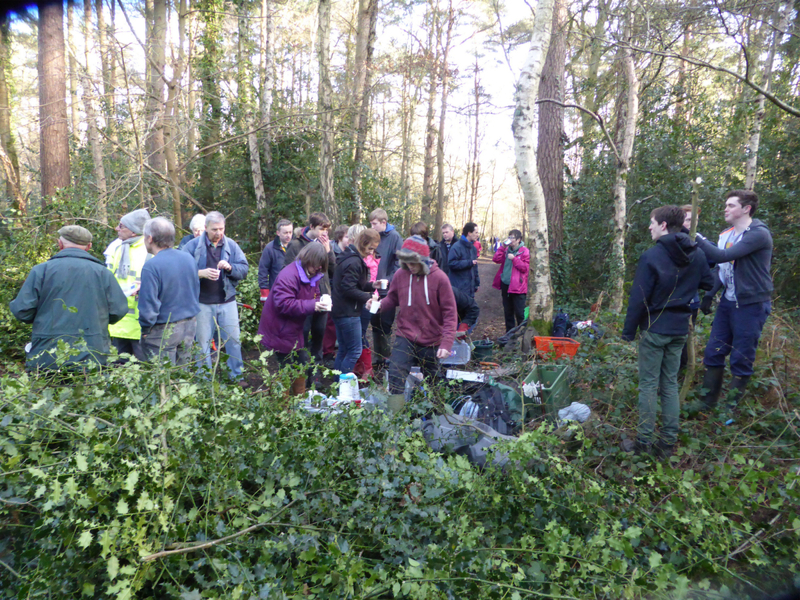 There will be a volunteer event this Sunday, 8 March at Fleet Pond. 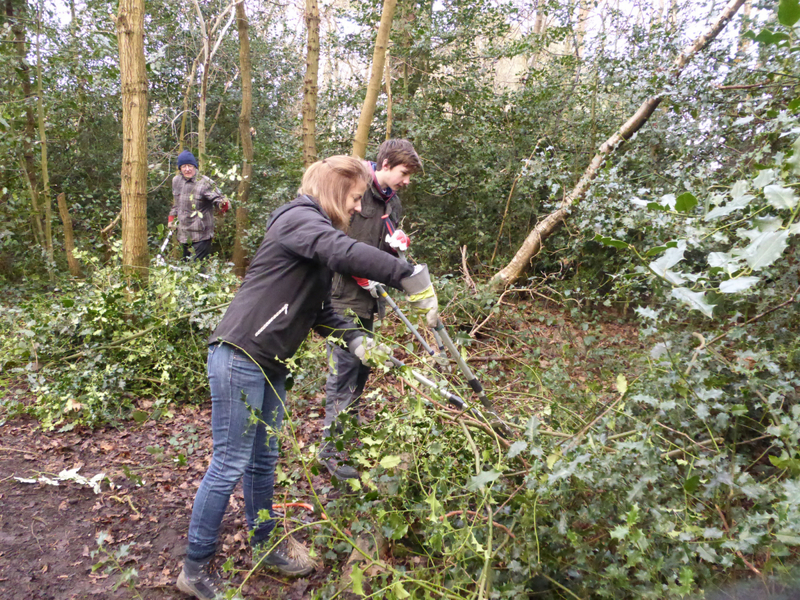 The tasks are supervised by a Hart Countryside Ranger together with members of Fleet Pond Society (FPS). 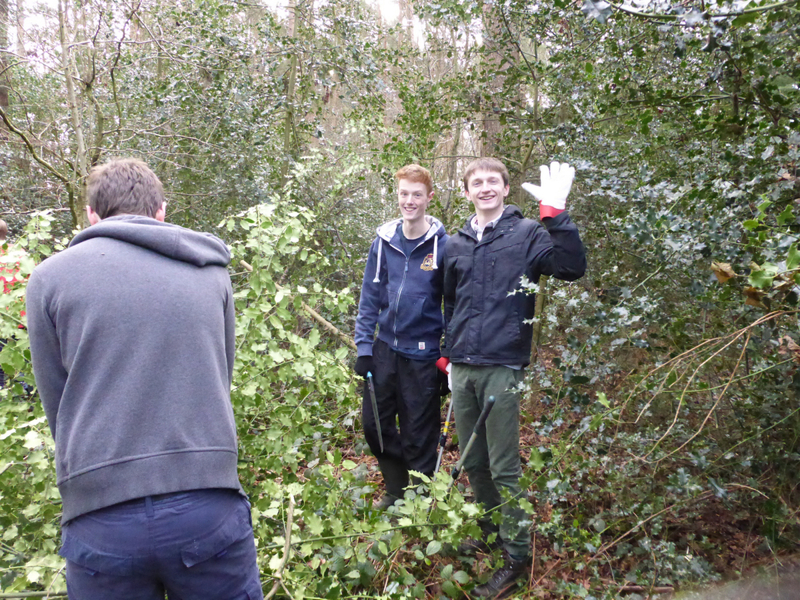 To get a flavour of our activities, here are some photos from the previous Sunday volunteer event, held on 8 February. As you can see, these events are good fun and quite popular! 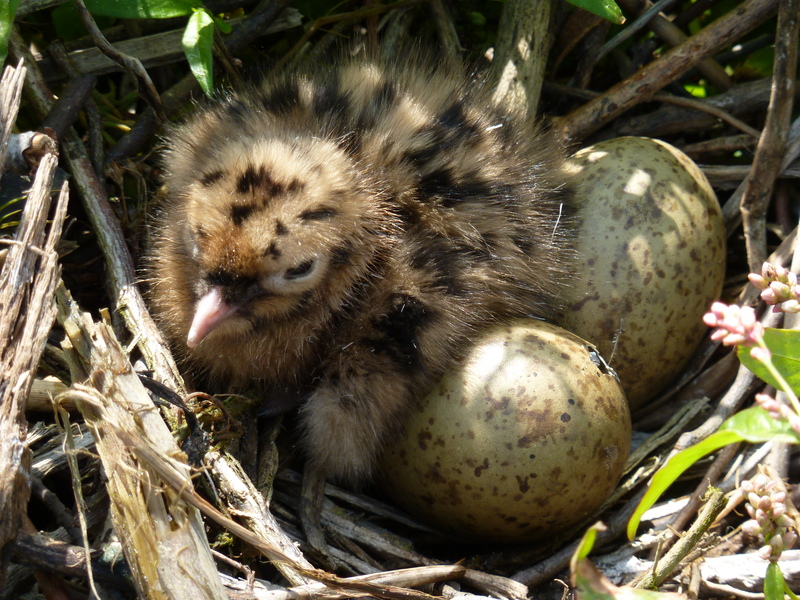 You are currently browsing the Fleet Pond Blog blog archives for March, 2015.